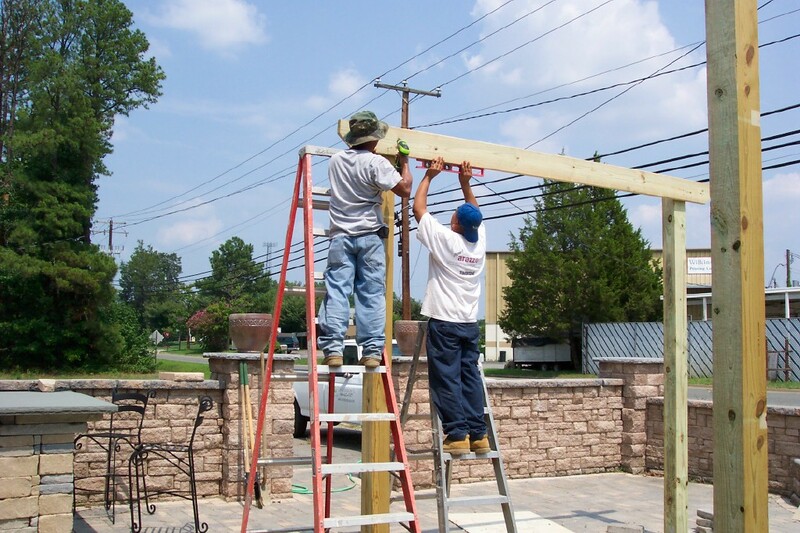 How to Build a Pergola in Two Days! 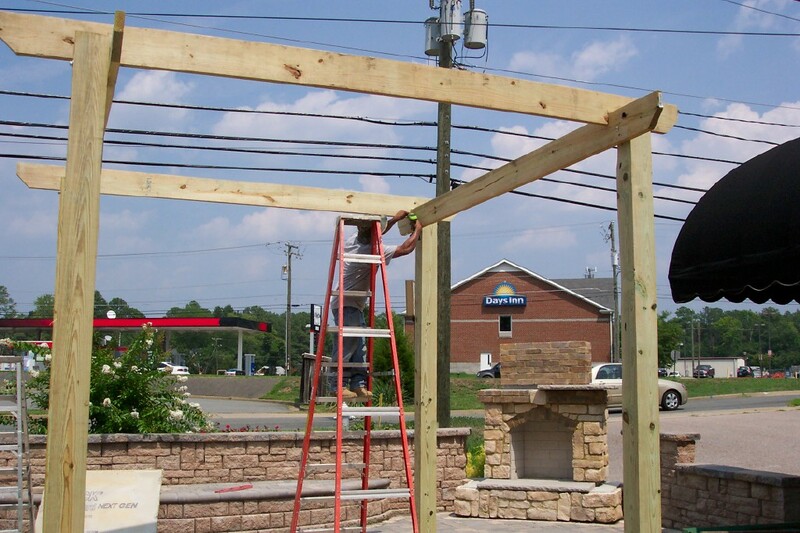 We just added a pergola to our outdoor showroom at the Carville Landscape Co. offices and I thought I would take a few pictures to document the building process. 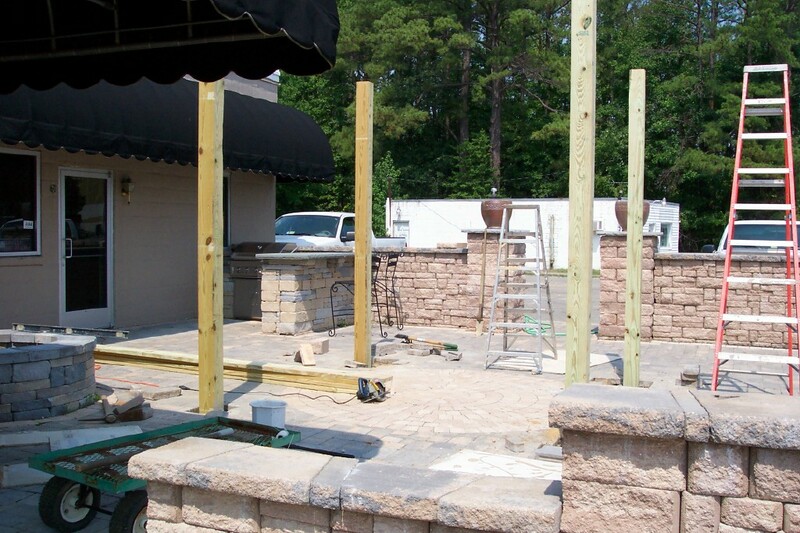 Here is a photo blog of how we built our pergola; a little play-by-play for all you weekend warriors. 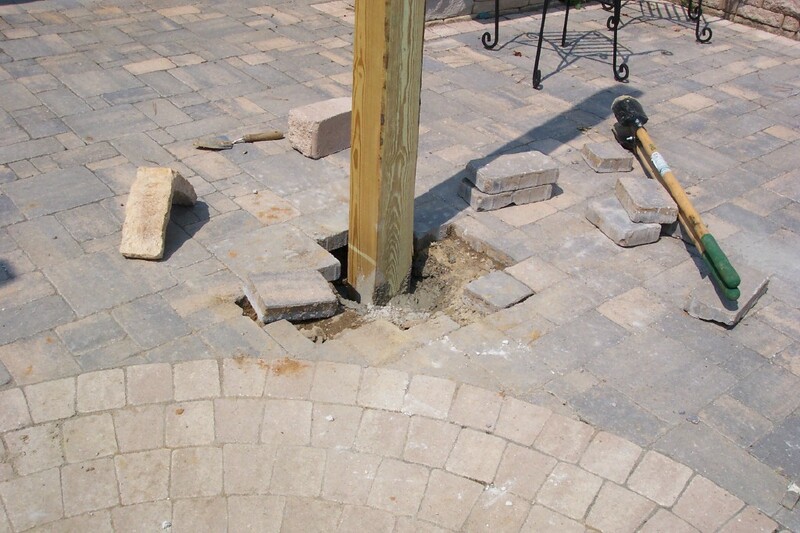 First, start by digging the post holes at least two feet deep, install posts and concrete. Cut all the posts to the same height. Let the posts set up for a day. We used pressure treated wood, you could use cedar, but make sure the wood is rot resistant. All four posts set and cut to size. Once your posts are set in concrete, attach your bottom support boards to your posts. 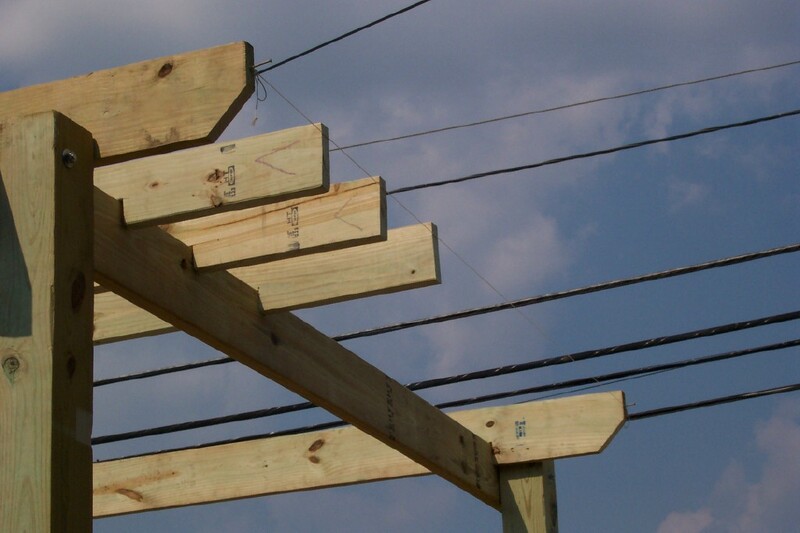 Make sure the boards are level and bolted to the posts. Bolts should be long enough to go through the entire support board and post. Level support boards and attach with screws to hold in place. Bolt the supports into place. Then you are ready for your cross beams. Place the two end cross beams first, then measure the distance between the beams to determine how many center beams to add. Attach all the cross beams with at least two screws. We notched out the boards to fit over the support beams and added a decorative cut on the end. Be as creative as you like with the cross beams. 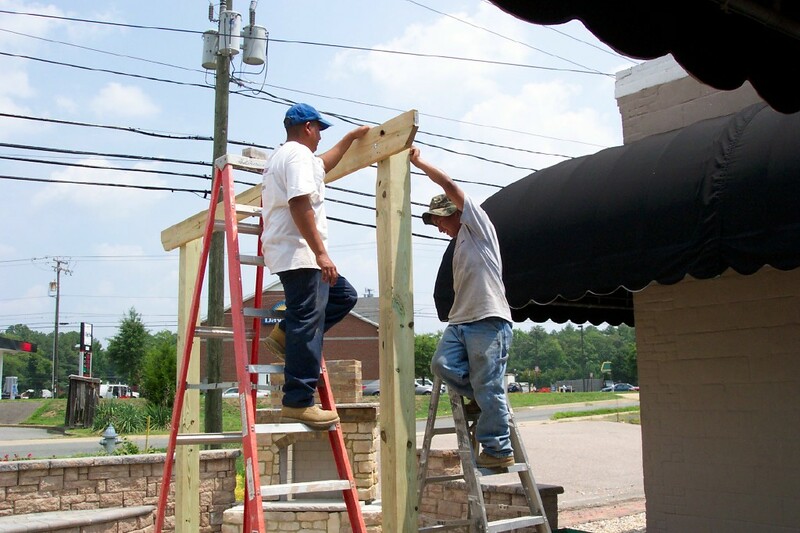 Attach two end beams first. Add center beams. We attached a string line to make certain all beams line up. 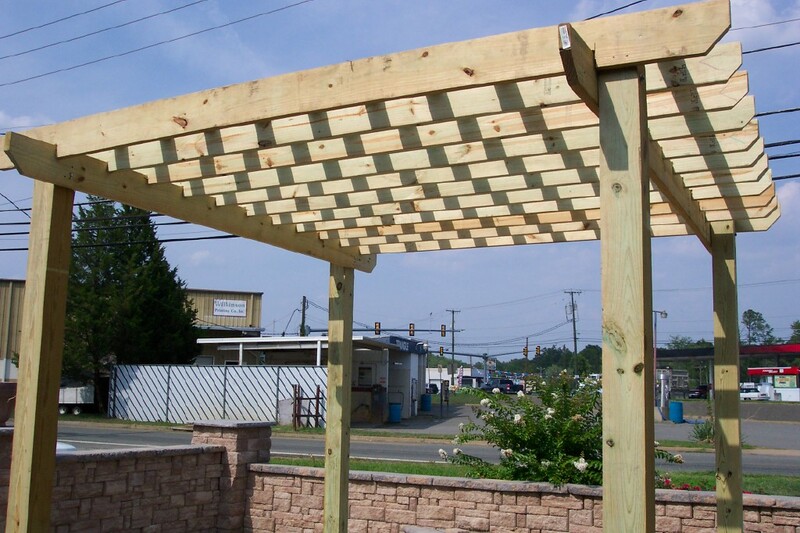 Finally, you have a finished pergola! Now add the television, sound system and fan or outdoor lighting to make it the perfect shady retreat. Sit back and enjoy!